(a) He knew nothing about airplanes and automobiles. (b) He welcomed immigrants into the United States. (c) He belonged to a relatively new political party. (d) He was probably not a member of the Republican Party. (e) He could have lived in the State of California. 2. Identify at least two key positions of the Whig Party. 1. The Whigs were against annexing Texas. 2. The Whigs were against slavery. Point two is a bit overstated. The Whigs were not an "anti-slavery" party. (Minus 1). 3. What caused and what ended the Mexican War? Texan Annexation: Mexico had previously warned that would consider annexation an act of war. When the annexation to place, Mexico actually did not declare war, but broke diplomatic relations. Boundary Disputes: Whether Texas was an American state or just a rebellious Mexican Province, the United states continued to maintain the fact that the Rio Grande was Texas's southern border - Mexico insisted that it was actually a river much farther north. Pacific Ocean Boundaries: President Polk was determined to expand the country so that its western border became the Pacific Ocean. He did succeed in this. The Treaty of Guadalupe Hidalgo, signed by Nicholas Trist on February 2, 1848, brought an end to the Mexican War, gave the U.S. undisputed control of Texas, while establishing the southern border of Texas as Rio Grande River, and added to the United States the present-day states of Nevada, California, Utah, and parts of Arizona, Colorado, New Mexico, and Wyoming. 4. Who do you think was the most important person in the period 1840-1860, and why? Abraham Lincoln was by far the most important person in the period 1840-1860, if not the most important president in America's History. During his presidency, Abraham Lincoln made changes that changed America; he is remembered today for those significant achievements. Abraham Lincoln harnessed his iron will and resolute determination to improve America. See here for the rest of my (very long) answer. Superb, except Lincoln wasn't president yet! grad Be sure to answer the question. (Minus 2). 5. Explain what "Bleeding Kansas" was. 'Bleeding Kansas' is the name for the conflict Kansas had of slavery. The 'bleeding' part of the name originates from the violence involved in this conflict. 6. Explain the cartoon, and what you think the cartoonist's view was. 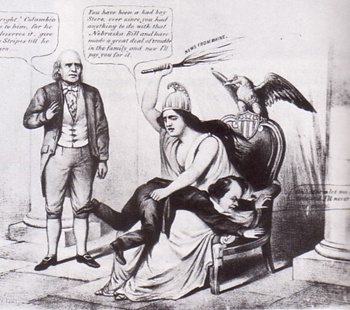 The woman's quote begins, "You have been a bad boy, Steve, ever since you had anything to do with that Nebraska Bill ...."
I believe it represents America (the lady) spanking Stephen Douglas. She spanks him because he helped pass the Kansas-Nebraska Bill. This bill open back up the question of slavery in the west. The cartoon is showing that Stephen Douglas was wrong , and indirectly, that slavery was wrong. The cartoonist was most likely a Republican or just a person who did not agree with slavery being right in the states. 7. Do you think it was possible to avoid the Civil War? Explain. No, The Civil War was absolutely unavoidable. Slavery was an extremely important issue to many people, whether they were for or against it. Nearly each individual had their own opinion and was ready defend that opinion. The American population was almost evenly split over the slavery issue - a country cannot survive divided, because if a country is divided, they are weak and susceptible to war from other stronger countries. So, war took place - no agreement could be reached to satisfy both sides of the issue. The only way to settle this dispute was through war. The Civil War lasted 4 years; but its monumental impact on America lasts even today. Superb analysis. Good for the model answer! This page was last modified on 28 November 2008, at 09:59.